ThinApp 4.7 Essentials book – Win your free copy ! 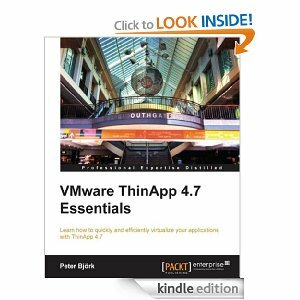 I already mentioned the ThinApp 4.7 Essentials book by Peter Björk in a previous post on this blog, and now thanks to Packt Publishing I can offer 2 copies of the book to the lucky winners of a small competition. The rules for the competition are straightforward. To win your copy of this book, all you need to do is come up with a comment to this post highlighting the reason “why you would like to win this book”. Please note: Only winners residing n the USA and Europe would get a chance to win print copies. Others would be provided with eBook copies. The contest is valid for 7 days, and is open to everyone. Winners will be selected on the basis of their comment posted. On Monday December 10th 2012 09:00 CET the comments will be closed. The winners of the ThinApp 4.7 Essentials book are NiTRo and Michael. The last couple of days there was quite a bit of ThinApp news ! Time to post another ThinApp-PowerShell function. On August 19th 2010 the long awaited ThinApp SDK became available.It allows you to programmatically interact with your ThinApp packages. The SDK package is foreseen to be used with Visual Studio, as can be deduced from the included merge module called ThinAppSDK.msm. The samples that come with the SDK unfortunately only show the use of the SDK with C++ and VBScript. But with a bit of fiddling it’s quite easy to use the APIs from your PowerShell environment. some usage examples from PowerShell.